The monster that was in my bed. I’ve been sitting around my apartment and finding these spiders crawling about. They are only about the size of my thumbnail, and look rather harmless. But when you take a micro lens to them they start to look like giant monsters! Nancy found the one in this photograph crawling down the headboard of the bed the other day. I really want to get a bellows system for my lenses so I can go in even closer on these subjects. I want to start fringing on the microscopic. It would be interesting to start studying just an eye full frame, or maybe the hair on one of the legs. Anyway, I hope to capture some more macro shots over the coming days. I’ve been looking for butterflies and moths, but the birds are getting them fast. Yesterday I was about to start shooting a butterfly and a bird swooped down in front of me and picked it right off the tree! Doh! 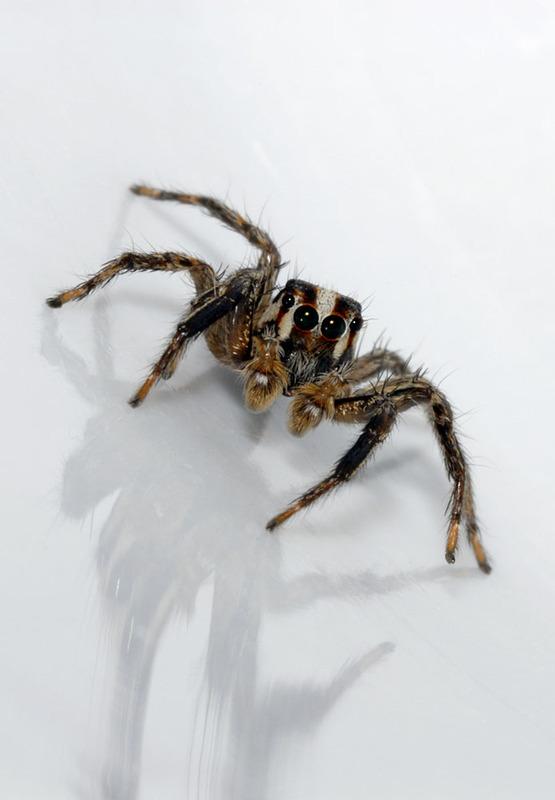 You can see more images of the spider and other critters in the gallery.